Keep all your pens in one handy place with this natural wood storage box. 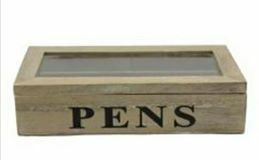 It has a glass lid and reads the words "PENS" in black text on the front of the box. It is a great gift for an office friend, men and for anyone you know who can never keep hold of their pens!